When does compassion become caring too much? Learning how to keep a professional distance will prevent you becoming too emotionally involved with your patients, writes Kathy Oxtoby. The decision to become a nurse is often driven by a desire to help people, and many nurses are prepared to go the extra mile to support their patients. But for some, particularly those just starting out in their careers, it can be hard to know how involved to get in patients’ lives. 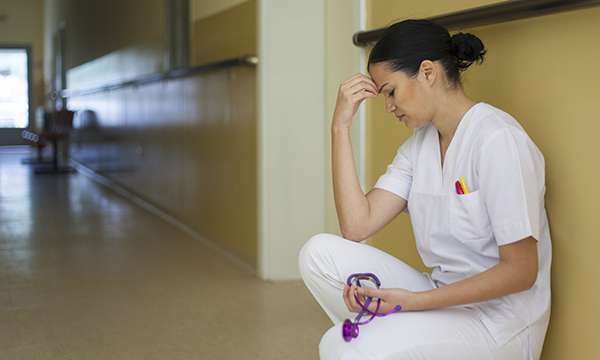 Senior lecturer in adult nursing at the University of Hertfordshire Beverley Brathwaite says for nursing students there can be a mismatch between being sympathetic and professional. It can be difficult to know when you have crossed the line from being compassionate to caring too much. Certain areas of nursing, such as palliative care, demand a level of involvement that can prompt nurses to feel they need to go above and beyond their typical duties of care. But there are warning signs that indicate you have become too involved. ‘If after every interaction with a patient and their family you are becoming more upset by the situations you are facing, that could mean a line has been crossed between caring and professionalism,’ says Ms Brathwaite. She warns that if you are not able to switch off from a case, and are thinking so much about one patient it is detracting from the care of others, it is time to set boundaries. If the relationship between the nurse, patient and family becomes too close, it can affect the care you deliver. ‘Those you are caring for could be worried about how you are feeling, and may feel they can’t talk to you about their concerns as it might upset you,’ says Ms Brathwaite. Self-awareness and recognition that you have become too involved with a case is the starting point for seeking support, which can be both formal and informal, she says. Nursing students can discuss any challenges they are facing with their personal tutors. If they feel the difficulties they are experiencing are affecting their physical and/or mental health, they can use the counselling services available at universities, or seek advice from occupational health departments. Ms Brathwaite also suggests talking to a link lecturer, or sharing your concerns with family, friends and peers, as long as you maintain patient confidentiality. When feeling conflicted about how far you should be involved with patients and their families, Ms Brathwaite says you need to be ‘aware of every encounter with them, reflect and know yourself so you can share what might be challenging, and consider who you should share those challenges with’.